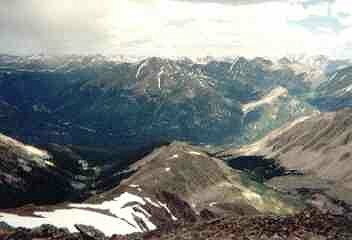 Nolan's 14 is a race across the 14 summits over 14,000 ft. in Colorado's Sawatch range from Mt. Massive to Mt. Shavano. 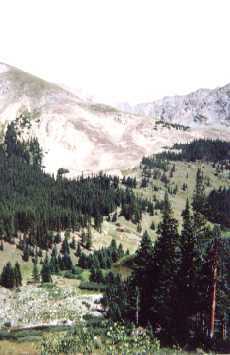 The course is not marked, and runners may choose any route between summits. The distance is 88 to 106 miles depending on the route chosen, with about 45,000 ft. of climb. As of the last two years, nobody has completed more than 11 summits within the 60 hour time limit. The race alternates direction each year. 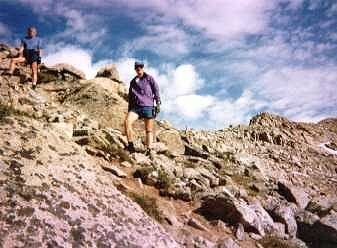 On Aug. 12, 2000, the race was north to south, beginning at the Fish Hatchery in Leadville, the trailhead to Mt. Massive. Matt Mahoney and Eric Robinson climb Massive near the 14,421 ft. summit. Gordon Hardman and Blake Wood descend Massive. The course drops to 10,500 ft. before climbing Elbert. 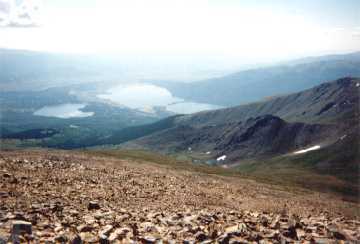 Twin Lakes seen from 14,433 ft. Mt. 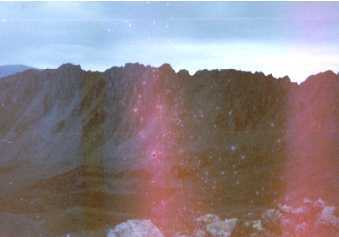 Elbert, highest point in Colorado. 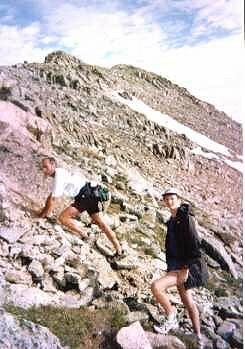 Descending Elbert via. 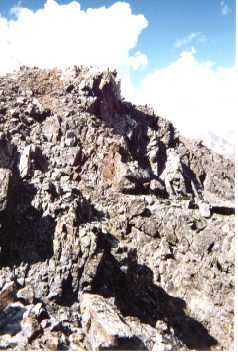 the southwest ridge toward the 200 ft. climb up 13,761 ft. Bull Hill. These next 3 photos were taken a week before the race. On race day, it started to rain here. 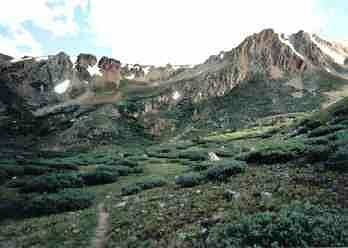 Near treeline (11,800 ft.) on the descent into Echo Canyon (10,000 ft). 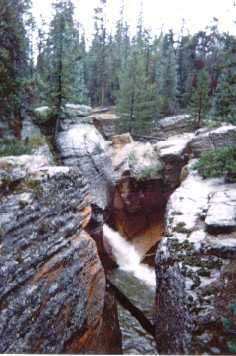 After two miles of paved road in a cold drenching rain, the weather let up and we crossed a small slot canyon on a bridge at the La Plata trailhead. Climbing steep boulders near the summit of La Plata in a mix of rain and snow. On the summit, my hair stood on end from static electricity, and the rocks buzzed and crackled, although the last lightning strike was two hours ago. 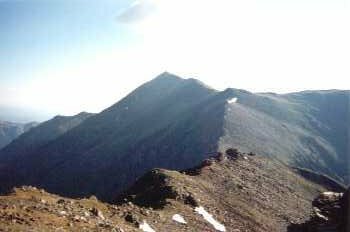 Eric Robinson reached the summit at 7:00 PM, but then began descending the class 3 Ellingwood ridge, which would have gone back north. He had descended 400 feet before realizing his error and had to re-ascend. Looking north from La Plata in July. 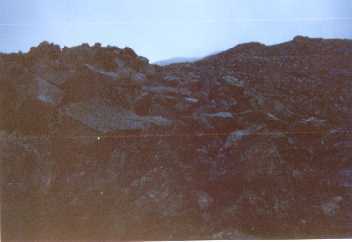 When we reached the summit, it was dark and cold, we were lost, and we had to pick our way across the wet rocks, often on all fours, holding a flashlight in my teeth. At least the rain had stopped. It took Eric and I 5 hours to descend, reaching Winfield at midnight. Blake Wood and Gordon Hardman descended earlier in daylight and cold rain, but Gordon dropped out due to hypothermia.